Below is a selection of Namibia Tours and Botswana Tours. When is the Best Time to go on a Namibia Tour? The most popular time to visit is Mid-Dec to Mid- Jan; late April to Early June; late Aug to Mid-Sept. The resort areas are at their busiest during these times. In May to Oct it is the dry winter season. The days are warm and sunny, while nights are cold, often with temperatures falling below freezing. 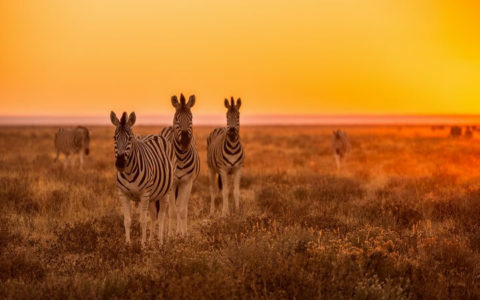 From Dec to March the Namib-Naukluft Park and Etosha National Park are extremely hot. Because of this, the Fish River Canyon is closed to the public between December and April. Flooding also occurs at this time, making the roads impassable. When is the best time to go on a Botswana Safari Tour? If you visit during these months you will experience a very dry climate with low humidity. The great attribute about visiting this time of year is that the animals congregate around the waterholes giving you plenty of time to take great photographs and quietly enjoy the tranquility of the scene. May – Cool temperatures of about 10°C in the mornings warming to 28°C in the afternoon. June, July and August – Very cold on early morning game drives, so pack your thermals. Expect the thermometer to drop to 6°C in the morning and below freezing at night, but you can enjoy warmer temperatures of about 25°C in the afternoons when you can laze by the pool at your accommodation. September and October – Now is when the heat sets in and wonderfully hot temperatures of about 35°C can be expected. November and December – You can expect cooler temperatures as clouds fill the atmosphere and bring on late afternoon showers. December mornings are mild at 20°C with hot temperatures of 34°C in the afternoons. This is a good time of the year for comfortable game safaris. January and February – Bring out your waterproof jackets and trousers for torrential downpours that can continue for days. It is not cold, but humidity is high at 50-80%. March and April – The rain lessens and the temperature cools again. This continues through to April with balmy, clear weather and temperatures of 30°C in the day.